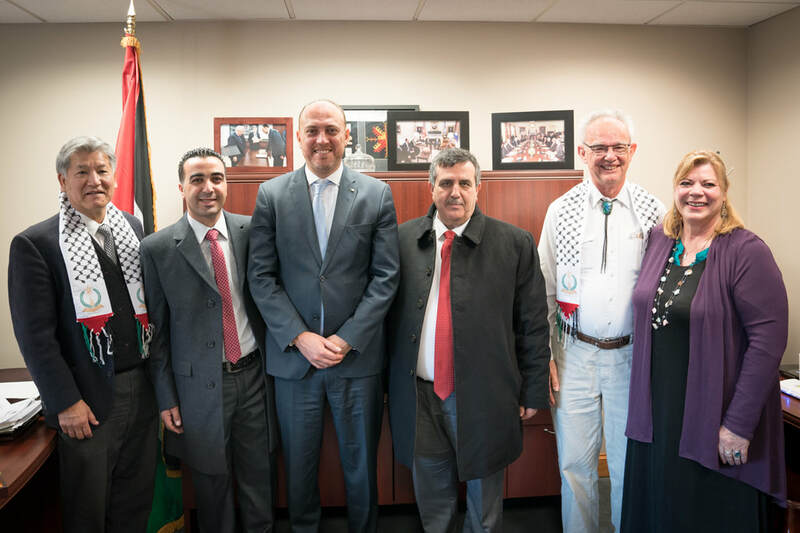 The Friends of Wadi Foquin held a successful briefing on Nov. 14 in Washington, D.C., for U.S. congressional staff to meet Palestinian mayors Ahmad Sokar of Wadi Foquin and Anton Salman of Bethlehem. The mayors spoke powerfully about the devastating impact of Israeli settlements on their West Bank communities and reminded attendees that it is U.S. policy to oppose the settlements. 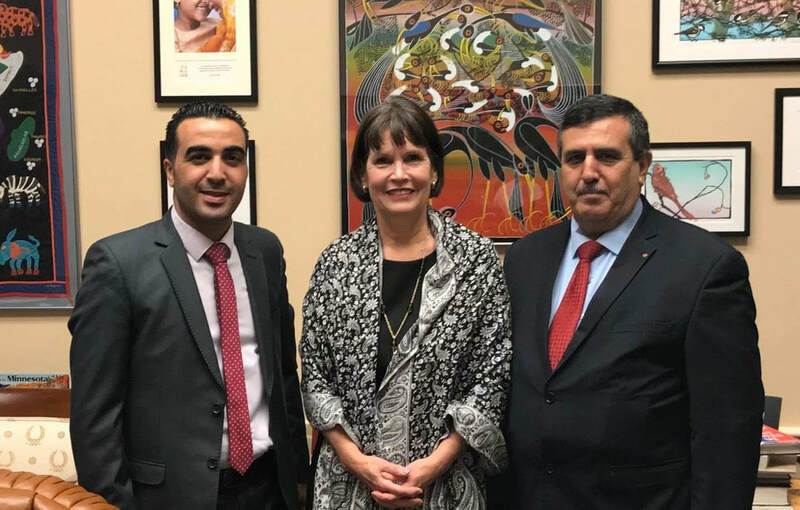 We were also able to meet privately with several legislative representatives, including Minnesota Congresswoman Betty McCollum, who introduced legislation (HR 4391) to end U.S. tax support of Israeli military detention of Palestinian children that same week. As a follow-up to our visits, we are asking legislators to contact the State Department to request the Consul General in Jerusalem visit Mayor Sokar in Wadi Foquin and intervene in the announced expansion of the settlement of Betar Illit. The mayor will contact the Consul General directly, and support from legislative offices will serve to reinforce his request. More will be forthcoming on how you can support this effort. A significant and timely meeting was also held with the new PLO Ambassador, Dr. Husam Zomlot. 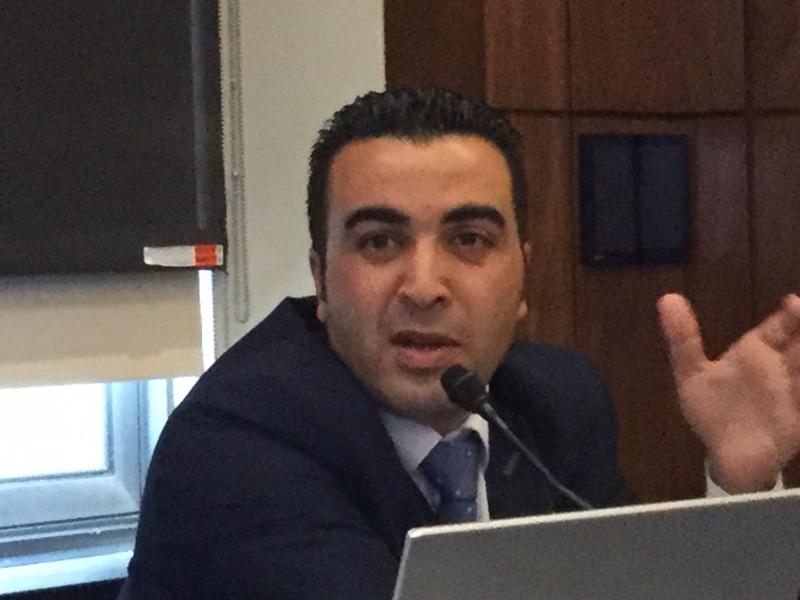 In addition to recognizing the significance of our interfaith relationship with Wadi Foquin, Zomlot stressed the importance of Mayor Salman’s presence and voice in Washington as a Palestinian Christian. He told us the PLO office will be hosting “A Bethlehem Christmas on the Hill” holiday party at the congressional office building on Dec. 6 as a reminder of the Palestinian Christian presence in the Holy Land. Thanks to Churches for Middle East Peace, Faith Forum, and the United Methodist General Board of Church and Society, which co-sponsored the briefing and helped arrange meetings. Click here for a GBCS report on the briefing. Below, from left: FOWF co-chair Michael Yoshii; Wadi Foquin Mayor Sokar; PLO Ambassador Zomlot; Bethlehem Mayor Salman; Rev. Mike Friedrich, FOWF pilgrimages co-coordinator; and Janet Lahr Lewis, General Board of Global Ministries Advocacy Coordinator for the Middle East and former United Methodist missionary to Israel and Palestine. Wadi Foquin Mayor Ahmad Sokar (pictured above) and Bethlehem Mayor Anton Salman will speak about the impact of settlement expansion on their West Bank communities. Friends of Wadi Foquin is sponsoring a U.S. congressional briefing on Tuesday, Nov. 14, in Washington, D.C., in response to Israeli Prime Minister Benjamin Netanyahu’s Aug. 3 visit to the illegal settlement of Betar Illit announcing the expansion of 1,100 new settlement units there. Since its establishment in 1985, Betar Illit and its accompanying outpost settlement, Hadar Betar, have annexed 500 acres of land belonging to Wadi Foquin. The expansion would cover a third hilltop belonging to the village. Wadi Foquin Mayor Ahmad Sokar will be joined by Bethlehem Mayor Anton Salman at the briefing to describe the impact of accelerating Israeli settlement expansion on Palestinian daily life in their respective communities and opportunities for Congress to intervene. In addition losing land, Palestinians in these communities are severely restricted in their access to jobs, schools, healthcare facilities, and agricultural fields due to the close proximity of settlements. Rev. Dr. Mae Elise Cannon, executive director of Churches for Middle East Peace, and UMC Rev. Michael Yoshii, co-chair of Friends of Wadi Foquin, will also be on the panel. • Ask your representatives and senators to attend the briefing by making simple phone calls to their offices and forwarding the briefing announcement. Staffers need not RSVP. Members of the public who plan to attend should RSVP to Kyle Cristofalo, CMEP’s Director of Advocacy and Government Relations, at info@cmep.org using the subject line Subject: Hill Briefing, 11/14. • Help defray briefing costs. Checks may be made out to BMU-FOWF and mailed to Jean Hart, FOWF Treasurer, Berkeley Methodist United Church, 1710 Carleton St., Berkeley, CA 94703; please note “briefing” in the memo line. For more information contact FOWF co-chairs Rev. Michael Yoshii at michaelyoshii1@gmail.com or Rev. Naomi Southard at nosouth@aol.com, or communications coordinator Julie Harris at julieharris61@gmail.com. Thanks to the generosity of several United Methodist churches and community organizations in Northern California, more than $8,000 was raised during Ata Manassra's September speaking tour for a guest house project to boost tourism and help offset agricultural losses due to encroachment by the illegal Israeli settlement of Betar Illit onto its land. Manassra is the coordinator of Narjes, the Wadi Foquin community development project supported by the United Methodist Church. The guest house will provide economic activity for the village while serving as a visible sign of resistance to further land confiscation. Donations for the project may be made through the United Methodist Church's General Board of Global Ministries (Advance project #3021565).